In most parts of the country, the air’s getting crispier. People are reaching for heavier knits, tucking their feet into adorable suede booties, and taking long, leaf-crunching walks in the chill. In San Francisco, we did that in July (minus the leaf crunching). Our October days are pretty hot (and fog-less! ), so I’ve been busy sunning myself (carefully, with sunscreen!) on the roof. The warmth is nice, but it feels pretty weird. I mean, we all try to pretend it’s autumn out here, making soup and reading Martha Stewart Living and thinking about Halloween treats and costumes but, between you and me, apple picking in eighty degree heat just isn’t the same. I mean, maybe you drive up to Sonoma county and find an apple orchard, and maybe it’s entirely gorgeous. You’ll probably get a basket and start picking, tasting as you go “just to make sure.” And it will be fun, for about ten minutes. Then you’ll start to really feel the sun beating down on you, because it’s hot, and you’ll wonder why you ate so many damn apples and also when might be an appropriate time to go home and take a nap? You’re sweating up a storm in your trusty “apple picking sweater” and there’s no cute stand selling apple cider doughnuts and decorative pumpkins and warm cider, anyway (not that you could drink anything warm in this heat), so it kind of feels like naptime might be a good idea. So you’ll leave — with eight pounds of apples, minor sweat stains and a deep-seated longing for the autumn of your youth. Oh well. That’s “autumn” in the Bay Area. We can’t be ungrateful. We’ve got sunshine, after all. 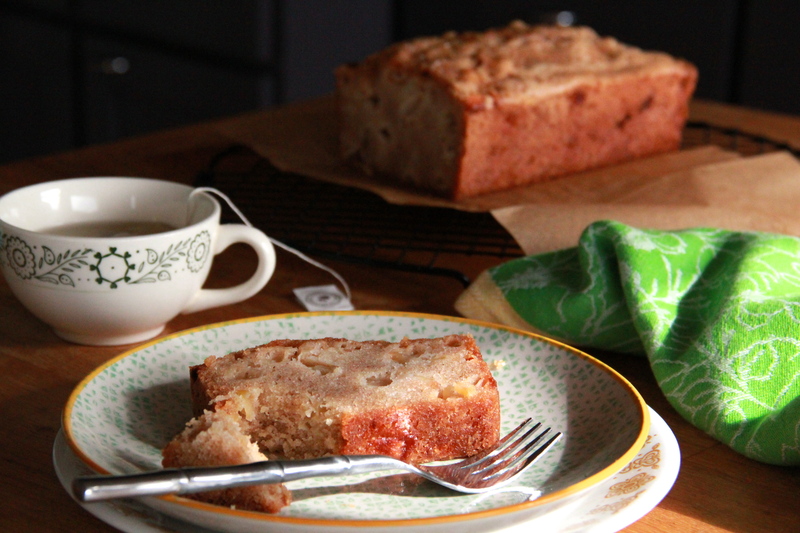 And apple cake! 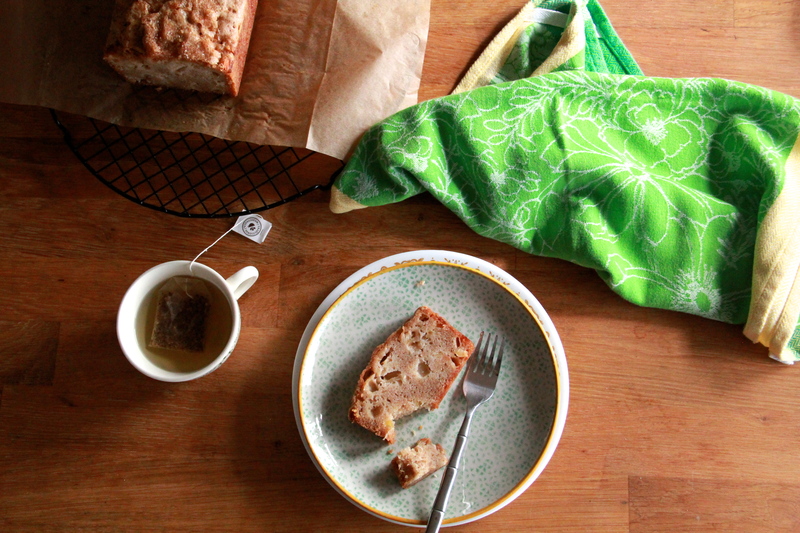 And lucky for us, apple cake tastes the same, whether or not we’re wearing cable knits. Happy autumn, all! 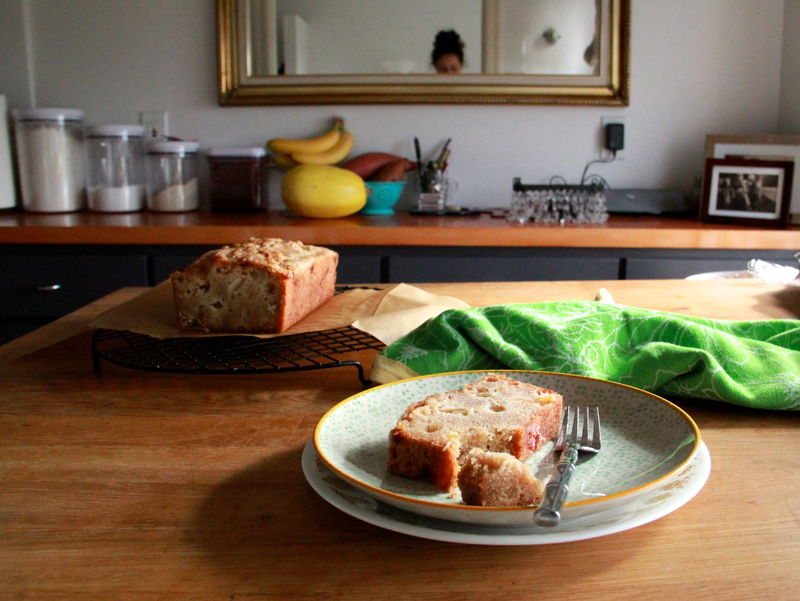 This is my favorite apple cake, ever. A bold statement, but it’s true. 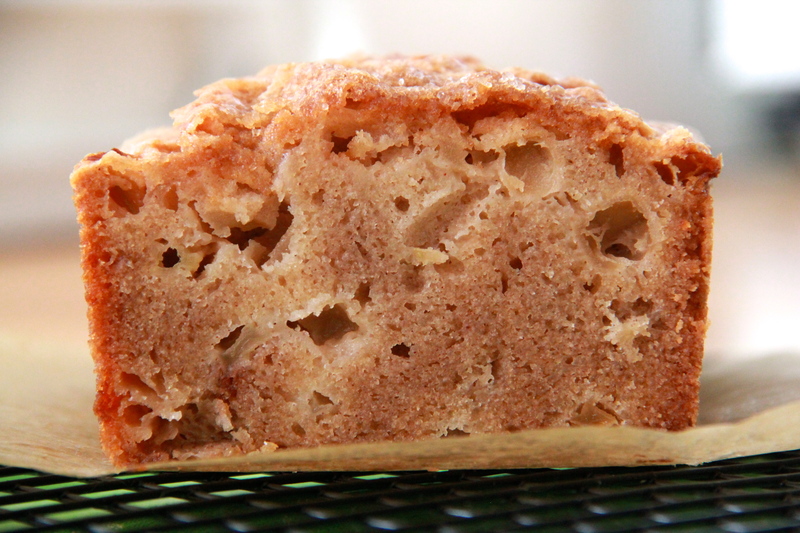 The top of the loaf is crackly and the inside is extremely moist, truly apple-y, with just a hint of warm spice, and the cake gets a supremely satisfying “crust,” one that goes all the way around the loaf, from the low baking temperature and long stint in the oven. I adapted the recipe from Ben’s Nana, Peggy, and I know I’ve said it before, but this lady had mad skills, in the business of baking. Heat oven to 325 degrees F. Grease a standard loaf pan and line it with parchment. Grease the parchment, too. In a medium bowl, whisk together the flour, baking soda, salt, cinnamon and nutmeg. Set aside. In a large bowl, whisk the sugar with the melted butter and vegetable oil. Whisk in the eggs, one at a time, until smooth and incorporated. Then add the vanilla and almond extracts, whisking well to combine. Add the dry ingredients to the wet, and stir with a wooden spoon or rubber spatula to fully combine. Add the apples, and fold them into the batter. Pour the batter into the prepared pan. Sprinkle turbinado sugar on top, if using. Bake the cake for about 1 hour, until a skewer inserted into the center of the cake comes out clean. Transfer cake to a cooling rack, and allow to cool partially in the pan, about 20 minutes. Once cool enough to handle, turn out the cake and finish cooling on a wire rack. Enjoy warm, probably with a bit of fresh whipped cream or, at the very least, a glass of cold milk. APPLE SNAP! I just baked something with apples too! This looks gorgeous. This cake looks so moist and delicious! The perfect recipe to try after I go apple picking out east this weekend! I’m really not an apple cake person, but I’d probably give this a try. You had me at crackly crust. I feel your pain! I am living in south Florida these days and autumn just isn’t the same! I think I will make this cake and crank up the ac and pretend for a few minutes.